We lived in a world in which people followed certain ideologies even for how to grip a racket. On the subject of the travel ban, much of the rhetoric coming out of Trump’s administration has focused on the dangers posed by immigrants. 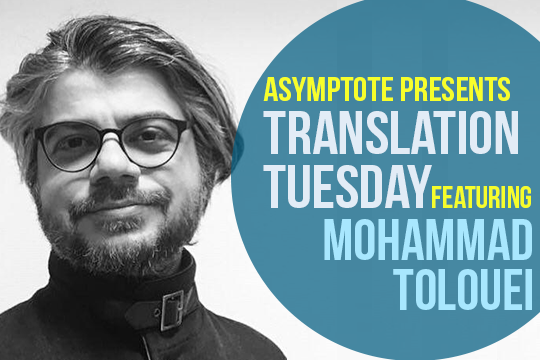 This devastating but ultimately heartwarming story by Iranian writer Mohammed Tolouei, told from the point of view of a four-year-old, conveys to us what it is like from the other side, that may not be so readily apparent to those who’ve never been forced to flee their countries. To be reckoned with, above all, in any decision to migrate, is the pain of uprooting from one’s homeland. This short story marks the first of many in an extensive showcase we hope to bring you, spotlighting new writing—and new translations—from the seven countries Trump intends to ban. If you’d like to see more of this showcase, there’s still a week left to pitch in to our fundraiser here. If you are an author who identifies as being from Iraq, Syria, Iran, Libya, Somalia, Sudan and Yemen (or someone who translates such authors)—and would like to submit work for consideration, please get in touch at editors@asymptotejournal.com. Our styles were totally different. My mother used to hit short, tight topspins while my hits were rather long and loose. I was more at ease with sidespins while my mother made better topspins. Yet in spite of all the trophy cups Mother had received, I won because of my playing style—the victorious western style. Mother still followed Eastern methods, yet Father wanted to take us to Denmark, a place in the West that ironically paid living subsidies, unemployment compensation and allowance for the children like most socialist countries. And in order to convince my mother to leave, each day he locked up more and more doors of our house.